Where masonry walls are showing signs of cracking, bulging, and leaning, it may be necessary to provide lateral restraint. Here at Stronghold Preservation we have a range of systems to consider in order to provide structural support and tie back the walls to the internal floor joists. Our experienced surveyors and technicians can advise on the best solution depending on the structural problem; often, an amalgamation of more than one system is the preferred option. As approved installers of Cintec Socked Anchors, and crack stitching systems, we at Stronghold Preservation can provide the best solution for the problem. Our trained operatives identify where the existing floor joists are, and drill holes from the exterior brick into the floor joists. Using a drill, the stainless steel lateral restraint ties are simply drilled through the pre-drilled hole, and secured into the floor joists. A resin is then pumped into the hole to securely fix the tie into the masonry wall. This is repeated at intervals, as specified by our technicians. 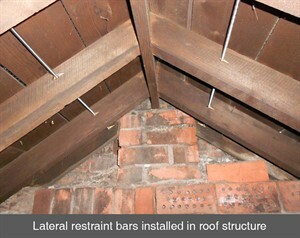 Traditionally, pattress type plates would be used; the lateral restraint bars are less visually intrusive and create minimal disturbance to the building and its occupants. The helical design provides multiple drip points crossing the cavity. The rotational flexibility accommodates normal building movement.